Jamala Wildlife Lodge, Canberra - well appointed and well close to the animals too. Ever dreamed of a sleepover in the middle of a zoo for the night? Here are Australia’s ‘Big 5’ of zoo stays that take the term ‘roar and snore’ quite literally. Jamala offers you a well-appointed ‘African-savannah’-style safari experience with five-star trappings, only 10 minutes from downtown Canberra. Rooms sit adjacent to many of the National Zoo’s animal enclosures, giving you face-to-face encounters with a menagerie of interesting beasties through reassuringly thick glass. On the outside of the uShaka Lodge, Giraffe Treehouses and Jungle Bungalows you can survey roaming animals as diverse as hyenas and Bengal tigers, while inside you can check out others including a massive bear from the safety of your bubble bath. Zoo with a view: Taronga’s safari tents looking straight across Sydney Harbour. The safari tents at Roar & Snore at Taronga come complete with show-stopping views to wake up to: straight across the harbour to Sydney’s skyline. On the inside, wooden floors and comfy beds elevate the accommodation well above normal camping. Behind-the-scenes activities such as giraffe feeding and getting up close with echidnas and meerkats will have the kids in raptures, while nibbles and drinks before the torch-in-hand nocturnal tours will see you right. If you haven’t seen enough animals overnight, you have the entire next day to browse as part of the package. Family accommodation Slumber Safari-style at the Werribee Open Range Zoo (photo: Trent Browning). Slumber Safari proves that zoo sleeps aren’t just for the young ones. Half-an-hour out of Melbourne, an evening at Werribee Open Range Zoo comes with grown-up-friendly essentials; drinks and dips at sunset and an ‘African-inspired’ dinner and buffet breakfast. The children aren’t ignored, of course, with a night walk around the 225-hectare property and scones, jam and cream by the campfire. 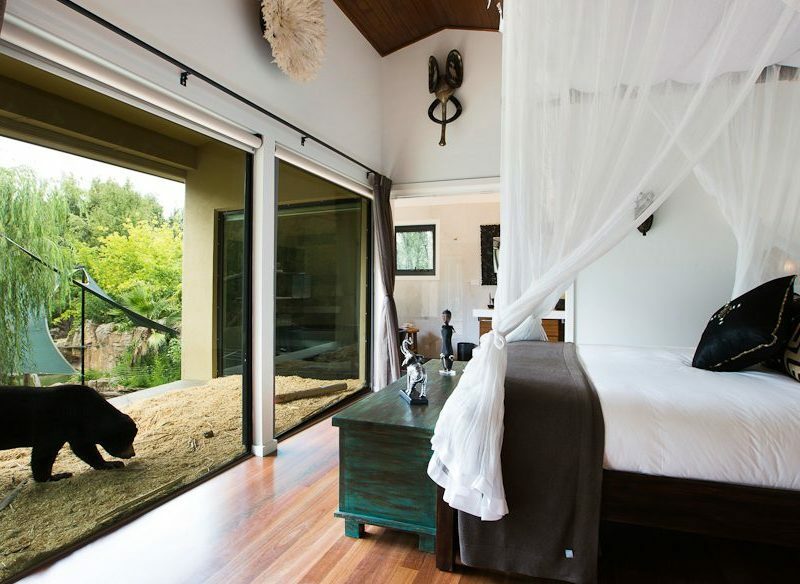 The safari is an intimate affair, with just eight tented lodges with en suites – each with a balcony – overlooking the Werribee River and the rhinos, hippos, lions, and zebras et al on the ‘savannah’. The zoo’s showers get the green tick of approval: they are solar powered and with a three-minute time limit. On the savannah, Werribee Open Range Zoo (photo: Trent Browning). The wide opens spaces around Taronga Western Plains Savannah Cabins. Taronga Western Plains Zoo is as spacious a zoo experience as you can expect; the animals getting plenty of room to roam around on the New South Wales plains. The accommodation options are similarly generous, ranging from the family friendly tents of Billabong Camp, to self-contained Savannah cabins (sleeping up to six with free wi-fi) and Zoofari Lodge (10 comfortable lodges) right on the cusp of the antelope and giraffe-filled enclosures. There are plenty of chances to interact with the animals too; hear a talk from a dingo keeper or spotlight African wild dogs after sunset. Zoofari Lodge guests have access to a saltwater pool and bike hire is included too. Dinner itself can be a culinary adventure with crocodile and kangaroo on the menu. Family time: Road ‘n’ Snore, Melbourne Zoo. More camping than glamping, but certainly a city zoo sleep worth trying out. Melbourne Zoo’s old elephant exhibit has been transformed into a camping area apt for a family adventure. You only have to bring a sleeping bag and pillow with just about everything else included: tents, beds, BBQ dinner – with a few wines and beers for the grown-ups – supper and breakfast from the bakery are all included. The enthusiastic young zoo guides are adept at wearing out the children with a slew of night-time activities centred on the nocturnal animals. The calls of the zoo’s gibbons are a particularly effective alarm clock.